AOL Group Property Casualty Insurance. AOL's special Property & Casualty group is underwritten by American States Insurance Co., wholly owned by Liberty Mutual Insurance Co. American States/AOL has teamed to save members hard-earned dollars, while meeting their unique insurance requirements. Since inception in the early 1990's, this program has earned many dividends amounting to more than $2 million in returned premium, direct to participating AOL member companies. For information about the availability & marketing of these insurance programs, call the AOL office. Objective: To assure a future timber supply to be logged under fair contracts and regulations, and to help maintain cost effective, safe and sustainable timber harvest which is environmentally sound. Analysis and input on state & federal policy-making for forestry, insurance, and other small business matters. Advocate logging issues on Federal Timber Purchasers Committee and other advisory groups. Maintain communications with legislative and congressional delegations. Sponsor both state and federal Political Action Committees (PAC) that support favorable candidates. 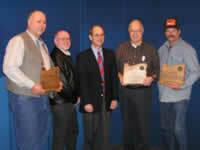 Champion logger positions at Oregon Board of Forestry sessions and other state boards and commissions. Stand for the loggers’ perspective in the activities of the Northwest forestry associations. Represent Oregon loggers as a founding member of the American Loggers Council. Uphold networking with grassroots citizens groups and provide support for their efforts. Cooperate with allied forestry associations to influence favorable timber availability and harvest practices. 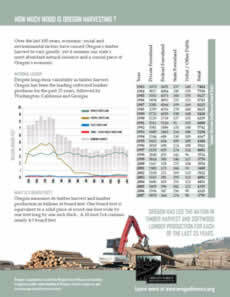 Provide for loggers’ input in the Oregon Legislature, and advance bills benefiting logging business. 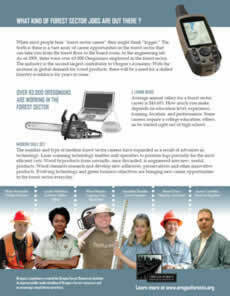 Assure logger positions are represented on federal legislation in US Congress. AOL plays an important role in influencing favorable law-making for the logging business, as well as stopping bad legislation by the Oregon Legislature and US Congress. AOL-sponsored Political Action Committees assist Association efforts to elect favorable candidates and encourage responsible legislative voting on logger matters. Assuring that public agencies develop and administer forest business regulations that are advantageous to loggers. AOL represents the logging industry with procedures such as Oregon Forest Practices Rules, state and federal administrative rule-making, Board of Forestry, endangered species, OR-OSHA, Bureau of Labor & Industries and Workers’ Compensation Division. AOL is actively involved in state and federal planning processes at the district, regional and national levels. AOL forestry staff interacts with the Oregon Department of Forestry, US Forest Service, Bureau of Land Management (BLM) and other agencies. Government forest planning guides the available public timber supply. AOL members are represented in many other public policy issues that affect logging businesses such as: forest practices, insurance matters, tax policy, OR-OSHA inspections, labor concerns, forestry incentives, industrial fire regulations, timber trespass, safety issues, law enforcement, liability matters, Governor’s resource policy, land-use planning and land exchanges. In today’s contentious forest policy arena, litigation and legal scrutiny of both forest policies and timber sales have become common place. Your Association represents loggers’ interests in various legal proceedings to effect favorable rulings and legal outcomes. AOL works with the federal and state agencies to improve operational conditions for the logging industry. If an AOL member experiences problems in areas such as forest practices rules, sale layout, safety, contract interpretation or other related matters, they should contact the AOL office for assistance. Objective: Keep the members up-to-date on current events affecting the logging industry in areas of political events, government regulations, Forest landowner issues, matters of general business operations and to offer opportunities for members to discuss these and other issues. AOL holds four major statewide events each year. In January, the entire AOL membership gathers for a two-day Annual Convention designed to keep loggers better informed about new trends in logging and issues affecting their businesses. There are also sessions on business management and opportunities to hear leaders of government and industry speak about issues surrounding logging. Each Spring, AOL holds a weekend Board meeting. The AOL Board of Directors (state officers, charter members, past presidents, and district representatives) and the general membership discuss AOL’s plans for the coming months. The Board members make decisions regarding new and continuing AOL programs and approve the budget for operations. Each Fall, AOL holds another weekend Board meeting, just as in the Spring. All AOL members are invited and encouraged to attend the Board meetings. Each Fall, AOL hosts a statewide Logging Safety Conference. Other seminars on issues, procedures and AOL services are held throughout the state during the year. Objective: The Oregon Professional Logger program (OPL) is the voluntary professional standard that certifies harvesting companies for their continuing education in sustainable forestry, safety & business. 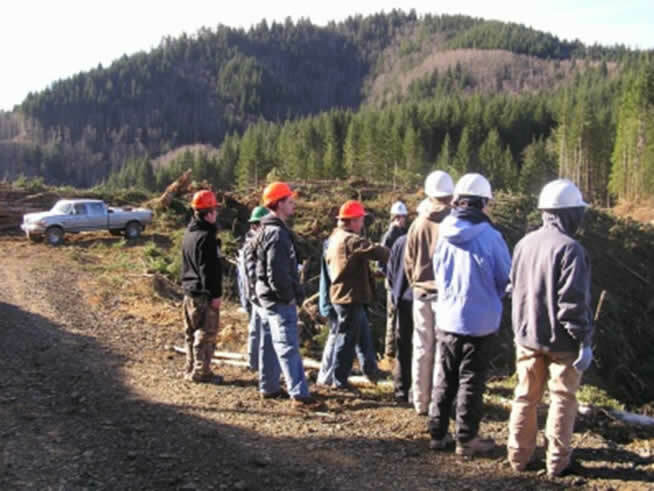 The OPL program promotes high standards for sustainable Oregon forest operations through training in current forestry, safety and business subjects. 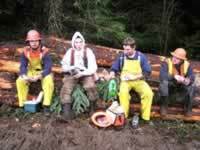 OPL is the only logging operator training program recognized by the Sustainable Forestry Initiative program in Oregon. Continuing education helps Oregon logging operators keep pace with a rapidly changing world by acquiring important business and forestry tools needed to succeed in today’s competitive times, and to prepare for tomorrow’s challenges. Foster operator compliance with Oregon forest practices and fire regulations through improved understanding of rules, compliance methods, and cooperation with state foresters. Foster operator compliance with Oregon safety, labor and business regulations through improved understanding and compliance. Foster federal regulation compliance. Demonstrate logging operator professionalism through voluntary education, without more government regulations. Maintain record of qualified Oregon Professional Loggers; publish OPL Directory available to others in the forest industry upon request. Qualify contractors to meet operator training & education standards required by many industrial timber landowners in Oregon, which comply with the Sustainable Forest Initiative (SFI). OPL logging operators fully qualify for Master Logger Certification, or MLC. MLC is the national logger accreditation program sponsored by the American Logging Council for the purpose of promoting professionalism in the logging industry, as well as responding to the growing forest certification movement across America. Work in partnership with American Logging Council to advance the Sustainable Forestry Initiative, which includes contractor-training objectives across America. 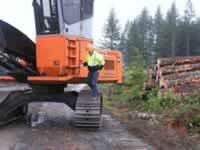 Sponsor training workshops and publish training videos for logging operators. OPL professional standards directed by a committee of logging operators. AOL maintains academic records for OPL companies. Objective: To carry out public information and education communication programs that promote timber harvest and issues important to loggers. Organize programs that promote timber harvest, forest stewardship and logger stature. Media public relations program including news releases and conferences. AOL website providing logging and forestry information on the world wide web. Speaking engagements at group meetings of outside organizations. Support local educational events which further loggers' goals. Promote public education on balanced forest resource management. Support effective forest information and education programs of allied organizations. Develop educational materials for students, the members and public. 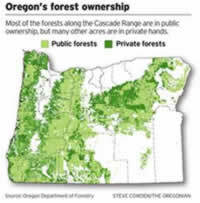 Provide input to the Oregon Forest Resources Institute. Cooperate with allied forest associations in climate building for active forest management. AOL has a long-term public relations program that has as its objectives, enhancement of the logging industry image, building of public acceptance of logging and providing the facts about our forests. Objective: To provide consultation when asked to facilitate the conduct of the loggers' operations. 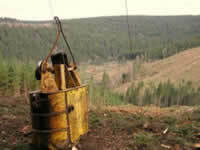 Provide on-site input at logging operations. Represent loggers with Oregon OSHA. 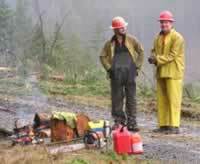 Provide for logging safety and training support programs. Act as loggers' representative, when requested, with agencies, purchasers and forest owners. Act as liaison in general forest industry problems. Work with higher education and others on logging research and development. Objective: Provide members cost-effective communication services for business and as emergencies necessitate. Northwest Oregon AOL Radio Network includes DTMF automatic phone patches, answering services, and a series of repeaters. AOL’s Network will become short-band compliant in 2013, as required by federal FCC regulation. Internet home page provides information to members on important issues affecting the profession. Information on various AOL programs, economic impacts, work force recruitment, forest industry resources and links to other industry groups are available on line. Objective: Support worthwhile benevolent opportunities for logger involvement and service to their communities in ways that spotlight logger commitment, pride and professionalism. Sponsor Log A Load For Kids fund-raising campaign in Oregon to benefit children in the three Oregon Children’s Miracle Network hospitals. AOL is the sole member of the Friends of Paul Bunyan Foundation, which serves to further the cause of forest science; education and public understanding of actively managed forests through grant programs. Sponsor a College or Trade School Scholarship Program for students studying to prepare for a career in the logging industry.